When is this cheap magician, Sathya Sai Baba doing to die? When I lived in Bangalore (in 1980) and studied for my MA in Mathematics at the world-famous Central College, my family (I included) drove in our Fiat car to attend a darshan of Sathya Sai Baba in his ashram at Whitefield, just outside Banagalore. A brilliant beautiful day, and we were not disappointed. The Baba came out in a well-choreographed setting, from behind massive pink walls, very majestic, very 'inspirational'. It is clear that he is a talented actor. Nowhere in the league of Amitabh Bachchan, but one who could get a role in a modest, B grade movie. He walked in his huge orange robe (which has plenty of hiding places) distributing vibhuti to a few randomly selected devotees, some of whom had virtually sprawled at his feet. Now, I had read the (then) recent exposes of his cheap magic tricks by P.C.Sorkar (whose brilliant magic skills I was fortunate to personally witness in Shillong in 2000), and, in addition, I had NO FAITH whatsoever that any man could possibly be God. So there was I, a bright young man standing upright, staring at him intently (if not insolently), trying to detect his cheap magic tricks. To do him some justice, I did buy and read his book (I have since thrown that book away – or possibly it is lying somewhere among my books in India – so I don't recall its title), in which he claimed to be an avataar, and found too many deficiencies in it to bother wasting further time on this magician. The only nice thing I recall of that visit – apart from gaining one more insight into the TOTAL LACK OF CRITICAL THINKING of most Indians – is that his Whitefield ashram sold excellent laddus. Now, that I did enjoy! But a number of my close relatives were his fervent believers and I have always gotten into trouble with them (I got into quite serious trouble with one of them on account of this questioning attitude, long before I encountered Sai Baba personally). To me the idea that anyone can claim to be an avataar is truly problematic. I have long held that should God ever visit us, "He" must be questioned extensively to ensure that we are not taken in by the claims of a fraudster. If God is truly God, he will have no objection to HEAVY DUTY testing. I personally have 100s of questions for Sai Baba, but of course he will NEVER let himself be publicly questioned. But why am I writing on this topic? I am writing this in the interest of promoting critical thinking in India. Please don't agree/disagree with me. Ask questions. Find out for yourself. That's what I teach. I don't preach Vedas nor any scriptures. I preach YOUR SUPREMACY. I preach YOUR MIND'S SUPREMACY, your right to think and be satisfied in the n'th degree about everything you are asked to believe in (see my last blog post on a similar topic here). Question: when will this magician die? Now, I don't envy Sai Baba his huge empire, built upon fraud and deception over many decades. Most religions are built on fraud, anyway, and if we were to start challenging religions on that basis, there would be no religion left. Human spirituality and emotionalism is very susceptible to fraudulent exploitation, and there will always be someone or other making a living off our foolishness. We have to take that as a given. But there is this important topic of when he will die. Sai Baba has made numerous claims, in the past, about the precise time of his death. He claims he controls when he dies, and can tell us decades ahead of his time of death. Now, that's a reasonably good starting point to prove you are God (why should God die is another matter). But I checked and found that his claims are confused for he has obviously forgotten about this various claims made at different point in time (God must have a short memory). Check this out (also this). Either way, it appears he must die only between 92-96 years of age (of course, God can't die, so "He" should presumably be able to live as long as he pleases – the idea of his dying doesn't make sense to me). But, born on 23 November 1926, he is ONLY 84 YEARS OLD NOW. 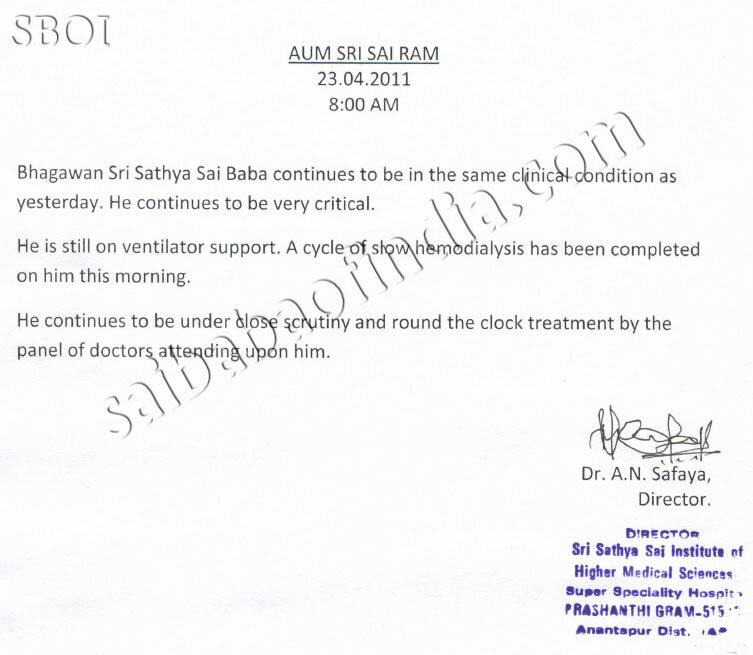 b) Why in heaven's name does Mr. Sai Baba need a doctor (or panel of doctors, round the clock)!!! Can he please explain! I am very confused. If I was God I'd not look for a useless physician who, in this current primitive stage of medical science, simply can't know much. As God I would, in any event, know far more about the human body than any mere, pitiable human. Or am I mistaken?! Is God ignorant as well? The condition of the Baba has deteriorated. Most of his organs have suffered severe damage and stopped functioning. Doctors attending on him are making attempts to save the Baba. Let us pray. 1) Within minutes of posting this, I received one of the most ferociously offensive and aggressive comments I've received in my life. I'm not publishing it but I will make note of all details including IP address should anything untoward happen. Clearly most people (particularly Indians) are simply unable to bear the idea of being questioned, leave alone appreciate that the purpose of education is to teach us to question. This entry was posted in Current Affairs, Philosophy, Religion and tagged in Critical thinking, magic tricks. It's possible that this drama in the hospital with ICUs and ivy drips etc will finally wake people up about this imposter. There's something very "humanizing" (or dehumanizing!) about someone being kept alive by machines. God, to me is one of the biggest business in the world, especially in India, where lack of interest on public issues and hero worship is very common. No wonder people like sai baba uses this oppurtunity. If baba dies, another godman will emerge without doubt as long as the problem remains. 1. A true Baba/Godmen/God or whatever you say, will never ever say it with aplomb if he is the "avatar" of so and so. 2.One will never make it an issue of public display of Magic as he did it most explicitly, making ash out of nothing, laying golden eggs out of mouth and waving it to blind followers etc.Youtube has plethora of videos exposing his "magic".We Indian has typical mindset of believing the people who can do some fraud "chamatkars" to our naked eyes and treat him as a supernatural being. 3.Whatever he has said and done comes as a part of his own Claim NOT something like people has treated and self realized it.Consider this in contrast of those Mystiques who never laid any claim (eg Sai Baba from Shirdi,Ramkrishna Paramhamsa,Adi Shankarachaya etc), but made its way from real philanthropy, scholastic behaviour and DONT-WORSHIP-ME attitude. May his soul rest in piece – God Bless Him !!! I agree. There are a very large number of followers who will now become rudderless. One of them sent me a most offensive message. I can understand that person’s personal agony, that his God is turning out to be a sham. At a minimum God should control the time of his “death”. The entire mental structure that people have built around Sai Baba’s alleged avataar, will collapse. That creates serious mental problems as people hate being taken for a sucker by anyone. The solution is better education, more critical thinking, more questioning. At least that will never let you down, because you are always on your guard; because you trust no one but yourself. Clearly Mr Baba has done some good as well, so on balance I have nothing to say about his life, except the fact that he could get away with this for so long is a classic example of the failures of our education system. Now, he may well recover and live to 92 (or even 96) or longer. That would still not prove anything – although I admit it would give some pause, and require further investigation. Intrigued by your last comment, "May his soul rest in peace", I just checked the news. Yes, he did pass away in the last few hours between my posting this blog post and the last comment. Sorry to hear that. In any event, that should totally rule out any possibility of his having been God's avataar. I trust his followers will open their eyes. Regardless, my sympathies are with them, including many of my own relatives who will surely feel badly betrayed. I can understand why they need such "faith". But is it not better to have faith in oneself? At least that's what I teach. I think the sturdiest proof of the existence of something is us. We exist. That can't be denied. Let's be content with that. Finally, I too would like to add along with you: May Sai Baba's soul rest in peace. Indeed, it is 11:40 am in India now. He passed away at 7:40 am, precisely 4 hours ago as I write this. is I realise Iam god but you are yet to realise . his taechings of love and affection to mankind are un forgettable . a) I at least broadly understand Advaita/ Vedanta. SB was not talking that language. He claimed to be a direct avataar of God. Big difference. b) He had NO BUSINESS to trick innocent poor people (including “educated” gullible people) with cheap magic tricks. That was unconscionable. Regardless, he did some good. That doesn’t absolve of his fraudulent, deceptive practice. I may well be “confused” but far less than gullible people like you who believe that the ends (doing “good” through building hospitals, etc) justifies the means (fraudulent magic tricks on the innocent). even I had no hint of his demise when I wrote "May his soul rest in piece"…That was somewhat sarcastic or maybe a genuine prayer for him as we Indian treat every Soul as a holy one. As for Uma Rao's comment – Its the material aspect of him that has made the belief so strong against all the teaching of Vedas and Vedantas which are much vocal about the illusions and disillusions.And I can site you with myriad cases where Hospitals & Trust are no benchmark of one kindness and humanitarian activities.Its the people like you who have lost all their wit to comprehend the true teachings and preachings of Scriptures and expect others to understand it for you,which they cunningly manipulate to their own advantage and get pronounced as a Dharmguru eventually.I have full regard for any Saint and Sainthood, but have never came across anyone who likes to sit in the crowd of thousands and enjoying the 'bhajans' on his name and having good gesture for those worshiping him as a GOD. Good reading. Both the article and the comments, particularly the one by S.M. Rao……shows that people have already started rationalizing about his demise, or should I say it is only his physical envelope that shall return to ashes (from dust unto dust), the ethereal being is still among us? Yes, this god business is truly profitable indeed, so is the temple business, you can build one in the middle of a major road and nobody will dare to demolish the structure….. But maybe, this is all yet magic…..probably the guru is yet to come back to us through some advanced yoga/tantra technique? However, if he has really left his earhly belongings, then it is a pity his devotees have not learnt whatever good virtues he espoused and just continued with the process of living, instead of flocking in thousands to see his body……………….just as others would adulate a Tendulkar…………. BBC published a documentary called – The Secret Swami in 2007. It was a very probing account of several criminal deeds allegedly happening inside the ashram. One of the most credible news agencies in the world, BBC would not do a news story of such an explosive nature without very strong evidence on it's side. Note that the above extract is from the sathya sai website and hence something they themselves accept to be the true version of the account. Read the transcript of the court proceedings, and tell me if any right thinking man cannot help feeling a terror in his heart at how the Supreme Court itself compromised it's integrity to save this man. "Probably these allegations are false. But why were they never allowed to be investigated? I find it incredulous that so many people would repeat similar allegations about a single person. What do they have to gain by saying such things out? Just think for a moment the nature of these allegations and what it means for these people to say that such things happened to them. I agree that he has done a lot of charity. Sathya Sai hospitals serve several hundred people everyday. His trusts have done far more to develop that region than the government. But does any of these diminish the mental and physical agony caused to these people if these allegations are true? Can a man abuse a child and wash the sin off by feeding 1000 children? What sort of morality is that? What if all this charity is just to give a cloak of respectability and to show something on ground for the devotees who are donating millions to the trust? Probably he is a good man. But I think that these people at least deserve a genuine investigation into their allegations. Is that too much to ask?" Anyway the man has passed away and probably the truth is buried forever. If these allegations are false, then he being a divine person, should forgive me for casting doubts. But if these are true, I don't want his soul to rest in peace. I didn't know what was going on with this madman. I am glad he died. Another fool will claim his position soon. Every time I read something like this, India and freedom don't seem have to any chance of surviving…..
3. a baby was born in 1963, is now 48 years old, and has already been 'groomed' to take over the mantle. Sanjeev Lal Kumar commented on India I promise to make you very rich's post. Sanjeev wrote: "Now he is DEAD and I am Very Happy But pls show some dignity by Editing the Subject "Cheap Magician" his followers won't understand instead get More angry and in anguish you would receive more Harsh comments.Secondly this is not the way absolutely NOT by such statements will anyone develop critical thinking?Instead it is making more rational and violent than ever.You're not adding Ghee to fire but Petrol." There will always be people who get angry at the truth. Such is the way of the world. But it is better that a spade be called a spade. Let them note not only do some people disagree that he was a "God" but also that his magic skills were quite poor. By being polite and nice, they will think that I am afraid or I have some "faith" in this kind of trickster. I DON'T, and I suggest they come to their senses as well. It will save them needless agony and grief. If they want to listen to a good sensible Hindu guru, they could try reading Swami Vivekananda, or, in the current times, Swami Suddhananda. Satyameva Jayate. Let the truth triumph. Amen. muitos outros Babas para promover o desenvolvimento do ser humano. Babas many others to promote human development. There are sufficient people with emotional confusion and distress at a given point in time, in this world, who become willing to believe in anything. Even DIRECT evidence of Sai Baba’s chicanry and magic won’t persuade them, for they have lost “faith” in their cerebrum (reason), being driven by their lower brain (amygdala). There is no “saving” such people. Their pockets will have a big hole, that is for sure. Being good and giving to others is NOT the exclusive privilege of Christians or Sai Baba devotees. I can tell you that, without giving examples. I have seen GENUINE care for the people among those who go about doing such things without CHEATING innocents. If there is God, He knows who is misusing his name. Trust me on that. I like u r ideas, I THINK WE MUST MAKE A PLAN TO REMOVE CORRUPTION. There are rich people who want to donate money and there are poor who are asking for help. Sai baba is just a mediator between them. He does not have a family or he does not have secret swiss bank account. I hope that you know something about hinduism, being born as humans we are alway subjected to forces like desire, ego, anger, emotions, love etc. Baba (also jesus) is also a human like us subjected to the above forces. Those donating money found something interesting in him, poor people go to them to get some kind of help. I see that something good is happening there (let there be some magic). I would be really happy if you can adopt such magic tricks to bring corruption free India. Learn something from him, with those little cheap tricks he made billions of people happy. Stop looking for a perfect recipe for bringing a change in India, go out, join with people and other groups like LS party. Only when you have the power or magic you can change India. I believe in god but I dont think Baba is god but I still support him. Kishore, I don’t teach FALSEHOOD. I don’t care for India as much as I care for my own integrity and self-respect. INDIA CANNOT BEND ME. It must bend to the truth. It claims to respect the truth (satyameva jayate), but follows FAKE people. That’s India’s problem, not mine. May his soul rest in peace….? If there is a soul of course..and if it does, why do you want it to rest in peace when it has committed so many acts of dishonesty and sin? you cannot just commit sins, die and take your soul and run away. The goodwill gesture that someone’s soul “rest in peace” is a courtesy that I believe everyone deserves. In any event we don’t control such things. If there is a soul, then tens of hypotheses exist for its “treatment” – we don’t know which of them is true, but if the soul does exist, then one of them would have come into effect automatically. If there is no soul (on current evidence I see no proof of such an entity), then the man is already at “peace”. No more can be said, I think. As far as “sin” is concerned, I have no view on sin. I know what is honest and what is dishonest, but “sin” – that’s someone else’s interpretation. My suggestion is that we engage in greater amount of thinking and questioning, and learn to distinguish honest from the dishonest. Just goto youtube & type Satya Sai Baba exposed. See documentries 1-4 for a good info of what all this jerk did. These expressions are used as gestures of courtesy to show that the one using them is "well behaved" and "civilised" person! May be they are also used because these words sort of end any further discussion and sound so very humane. Reason could also be that the human fantasy may expect lot of trouble and unrest including personal distress for oneself by the "unresting souls" – so it may be securer to "let all souls rest in peace". In any case a good (/cheap ?) human trick! And here is my problem – I don't wish peace to the departed soul because so many humans have been cheated by this soul. How do I express myself??? Just chill out. You can do nothing about it whether you like it or not.